Reeling from the Sunday afternoon sugar shock that was the Schwan's Rainbow Confetti cake, I decided it was only fair to dig into some real ice cream Sunday night. I was going to go triple chocolate cake, but then I realized a nice berry flavor was the way to go. 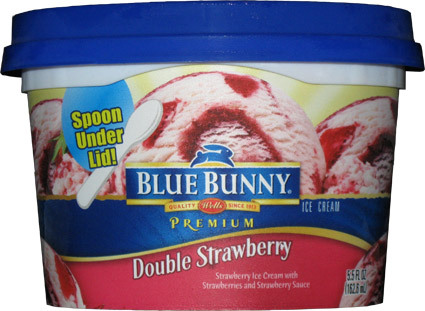 Blue Bunny must love the name Double Strawberry. I've had double strawberry sedonas and double strawberry ice cream sandwiches, and now finally here we are with a personal sized container of Double Strawberry ice cream. I like the fact that it's billed as strawberry ice cream with strawberry chunks and a strawberry swirl, sounds too good to fail. I got a nice potent blast of strawberry on the very first bite. Wow, it feels rare to get such a strong impression on the first scoop, though maybe I hit the swirl and not the ice cream. I dig in for some more and those scoops are just as good. The bites vary in intensity from creamy to extra strawberry, but it balances out as you get a nice coating of ice cream going. I told you I love a good strawberry now and then, and this one certainly qualifies. Now this doesn't have any cute little bunnies hopping through it like their Alpine Strawberry flavor, but that is just fine in my book. I much prefer these nice chunks of strawberry I am finding throughout this treat. Their was one chunk that was a smidge big, but it's got a good taste to it so I'm not complaining. 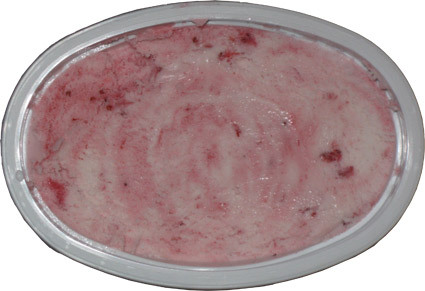 There doesn't seem to be a big solid swirl but more of just strawberry sauce everywhere. Again, this is fine, it really spreads the flavor out. This is a nice, sweet, creamy flavor. Not too heavy, plenty of strawberry flavor, no lingering artificial taste. I should definitely keep one of these in the freezer at all times for when my strawberry mood hits.